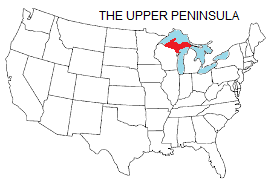 The Upper Peninsula Muzzle Loading Association is an organization committed to preserving the skills of our nation's early settlers, pioneers, and mountain men in the use of muzzle loading firearms and the equipment and accouterments that accompanied such use. The UPMLA endeavors to promote and maintain high standards of safety, sportsmanship, and good fellowship. The UPMLA is a small and friendly group, and membership is open to individuals interested in sharing its committment and in participating in its events. Club activities are centered in the Upper Peninsula of Michigan. (Link: U. P. Information). Three-day rendezvous the third weekend in July. Gatherings to shoot muzzleloaders in fun competition on the first Saturday of the months of January-June & October, with lunch after the shoot. An open invitational shoot in October for muzzle loaders in the upper midwest. Sponsoring an international postal competition with muzzle loading clubs in Canada and in several states including Wisconsin, Michigan, Texas, Florida, California, Arizona, and Alaska. Conducting a monthly postal match for individual shooters. For more information on these activities, go to the Events page. The officers of the UPMLA are a President, Vice-President, Secretary, and Treasurer, who are elected to one-year terms. The UPMLA Board consists of three members who are elected to staggered three-year terms. Elections take place at the annual meeting during the Rendezvous in July each year. For a list of current officers, go to the Contacts page. Our group in Menominee started shooting Black Powder in 1974 and started a project to restore a Homestead that belonged to the Rechardt family. With the coming of the Menominee Centennial in 1976, the group put on pre-centennial events at the homestead each summer to raise money. A black powder shoot was part of those events and shooters came from all directions. The UPMLA really got their start as an organization from the membership at Negaunee, by holding shooting events where UP and Northern Wisconsin muzzle loaders were brought together. The official UPMLA was born on May 15th of 1985 at Route 1 Box 48 Trout Creek, Michigan. I give credit to Sidney L. Lichtenfelt, president, for doing most of the legwork. Sid asked the following to volunteer to serve until we could have an election by the membership at large: Bonnie Willcock of Marquette, Wayne Thoune of Menominee, Don Curtis of Paynville, Tom Filcek of the Soo, and Dave Bilski of Iron Mountain. The Postal shoot has always been the glue that seems to hold the UPMLA together along with the UPMLA Championship Shoot. The Rendezvous that we always looked forward to was Le Sault at the Soo put on by Cotton and Bea Volrath. Another that I always liked was the Sesquicentennial Shoot in Rapid River, it being one of the best; we can give credit to Jim and Robin Phillips for those. People who really put UPMLA together? My picks are: Sid Lichtenfelt, Bonnie Willcock, Ralph Dollar, Greg and Ann Nyberg, and the originals. --Written by UPMLA then-President Clyde Mikkola.